York’s Local Plan is now one step closer to commencing hearing sessions led by the Planning Inspectorate. This follows the submission of important evidence to the independent inspectors, who have been appointed by the Government to examine the plan. This includes the modifications to remove housing site allocations (Queen Elizabeth Barracks, Strensall and Land at Howard Road, Strensall), which would remove 550 dwellings from the submitted plans housing supply. This follows a recent visitor survey commissioned by City of York Council, supported by Natural England, which highlighted that there would be significant effects on the integrity of the Strensall Common, a protected site, if the proposed housing sites adjacent to the Common remain in the Local Plan. A report detailing these recent modifications was approved by Executive at a meeting on Wednesday 7 March. 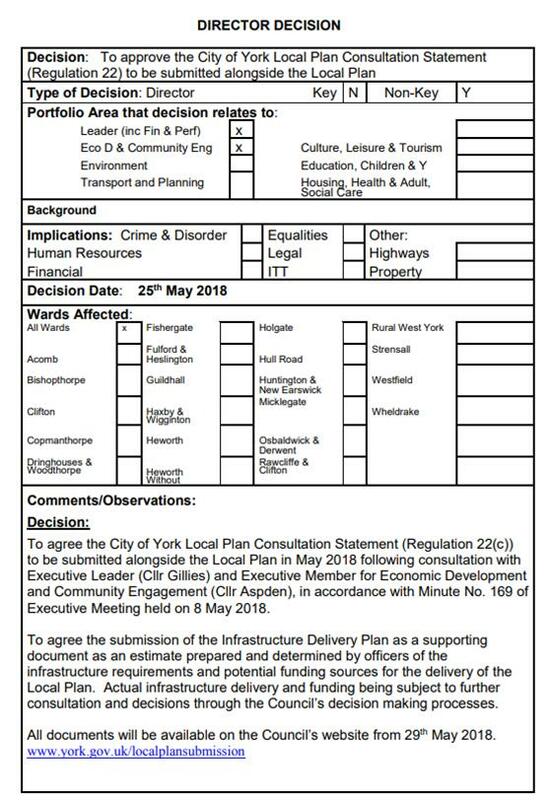 In addition to this, proposed minor modifications have also been submitted to formally revise the Objectively Assessed Housing Need (OAN) to 790 dwellings in York per annum. Minor amendments to the greenbelt boundary have also been proposed, in order to take into account recent changes such as planning decisions in York and the removal of the Strensall Barracks sites. It is hoped that by submitting this evidence to the inspectors, progress can be made to take the Local Plan through the examination stages and determine whether it is sound. 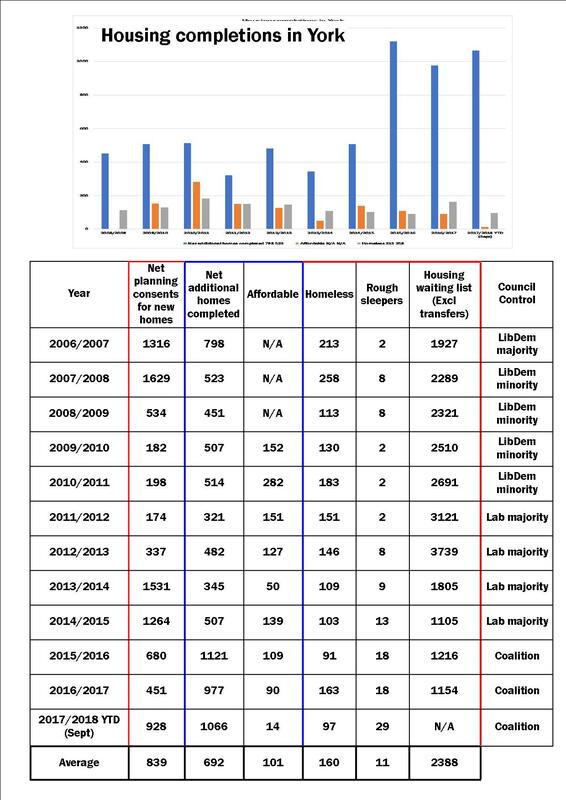 Poor research or something more sinister? A few days ago, Labour issued a statement condemning the City of York Council for agreeing to sell off Bootham Park Hospital. Only problem was that the Council had never owned the hospital site. Decisions about its future rest with NHS property, a central government agency. 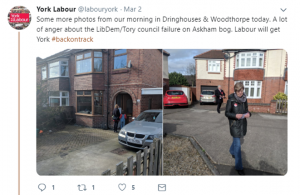 Now Labour candidates in Dringhouses and Woodthorpe are trying to blame the local coalition for the proposal to build near to Askham Bog on Moor Lane. It appears that the candidates – who in fairness appear to have little local experience – do not realise that it was a Labour controlled Council that first identified the site for development when they published their version of the Local Plan in 2014 (it is still available to be read “on line”). The previous version of the Plan, agreed by the outgoing LibDem led council in 2011, had retained the site in the Green Belt. An incoming Labour administration adopted a “Big City” approach to development and earmarked large areas of Green Belt for development. They wanted to grow the size of the City by 25%. This included building on the land at Moor Lane. Later the plan was jettisoned when Labour lost control of the Council following a by election in the autumn of 2014. The latest version of the Local Plan – backed by the ruling LibDem/Tory coalition – protects the Moor Lane site from building. Not withstanding this, developers are still trying to use the 2014 draft Local Plan as leverage to get planning permission for the site before the final revised Plan is implemented by central government. It takes a particularly thick brass neck to accuse your opponents of responsibility for a mistake that your own side made. NB. Labour have published their 2019 local election manifesto. In it they promise to build hundreds of new houses each year many of which will be in new “villages” on the outskirts of the City. The new “villages” will be located on what is now Green Belt land. It shows a spectacular reduction on previous forecasts. The report will be discussed by a Council working group next week, although the new figures have already been forwarded to planning inspectors. In 2011 a LibDem Council had agreed an annual growth rate of 575 homes. This was increased to a, wildly unsustainable, 1100 homes by an incoming Labour administration. An incoming coalition administration in 2015 finally came up with a figure of 867 dwellings a year. All have proved to be wildly inaccurate. 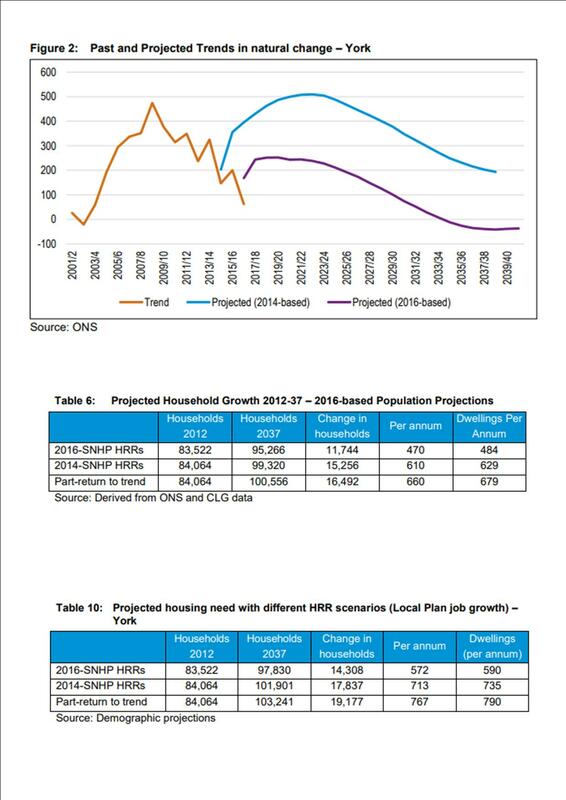 The new figures indicate that an additional 470 homes a year will be required in the period up to 2037. A high growth economy could increase this to 590 homes a year. .. and that is the figure that some commentators have been advocating for the last 8 years and more. Unfortunately old habits die hard, and the consultants say that, to deflate house prices (and values), a supply of 790 homes a year is required. City of York Council has received confirmation from the two inspectors, who have been appointed to examine York’s Local Plan, that a series of public hearings could take place as early as February. The council met its deadline of submitting the plan in May, following agreement to endorse the draft plan at a special Full Council meeting on 17 May. It also means York has met the timescales previously agreed with the secretary of state for Housing, Communities and Local Government. 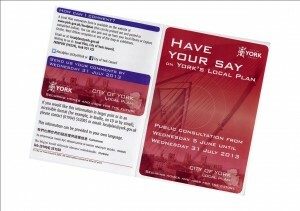 York Local Plan Infrastructure report published – if you can find it! 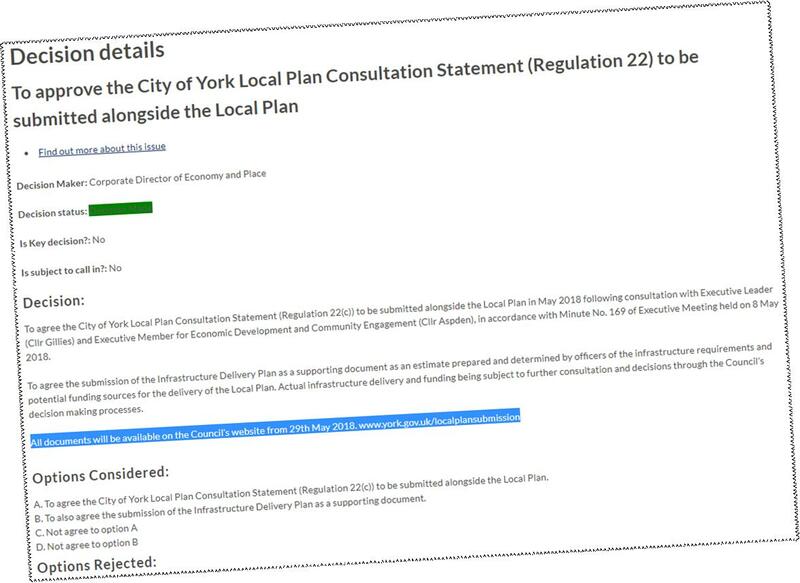 We reported last week that a behind closed doors decision had been taken to approve two key reports associated with the York Local Plan. They were to have been submitted to central government last week to meet the important deadlines. One report concerned the infrastructure delivery plan. We said that this should have been available publicly before any decision was taken. The decision notice (see below) said that instead it would be published on the Council’s web site on Tuesday (29th). It is an 80 page document which deserves some careful consideration. One active local commentator has pointed out that, given the many years that have led up to the submission of the Local Plan documents, the consideration of this document now looks like an afterthought. The Council has not yet commented on why proper notice of the decision meeting was not given in an open and transparent way. The Council has sent off to central government its proposed new Local Plan. It brings to an end (potentially) 25 years of agonising about the future size of the City.The plan is a compromise on growth rates with over 850 additional homes scheduled to be built in each of the next 20 years. 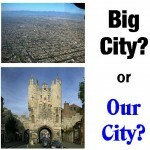 One key implications of this “Big City” policy is the impact that it will have on the City’s infrastructure. Health, education, leisure and – crucially- transport systems will come under even greater pressure as the population grows. The additional homes could wipe out any advantages being seen as a result of the small scale improvements currently programmed for the A1237. Arterial roads could also reach grid lock unless there is substantial investment. Hopes for an alternative network of public transport routes also hang on key investment decisions with part of the resourcing needing to come from developers. All the stranger, therefore, that a report on what infrastructure improvements will be needed, and how they might be funded, was take at a private meeting yesterday. The papers on the Council web site give little clue to the assumptions contained in the plan. The Council says that more information may be published on 29th May. 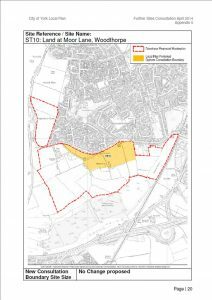 The plan to protect York’s green belt and special character while providing the housing and employment the city needs will be considered by Councillors this week..
A report detailing responses to the latest public consultation on York’s draft Local Plan will go before the Local Plan Working Group tomorrow and the council’s Executive next Tuesday (8 May). 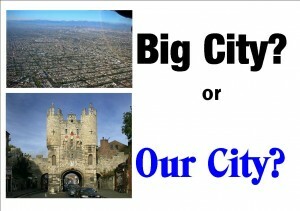 If Executive approves the proposals, the full council will vote on 17 May on whether to submit it to the government. This would see the plan submitted to the government within the timescales agreed with the secretary of state for Housing, Communities and Local Government. Providing levels through reducing, reusing and recycling. 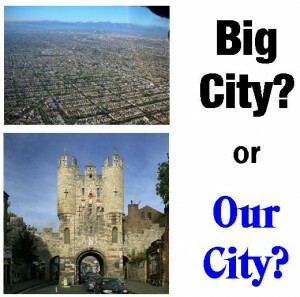 City of York Council is reminding residents to make final comments on the city’s Local Plan ahead of its submission to the government for examination. The council is preparing to submit the plan – which determine how the city changes over the next 15 years and beyond – to the government in May. The plan allocates the sites where new development should take place, taking into account factors like the green belt, the historical and natural environment, flood risk and access to public transport. The six-week consultation on the ‘publication draft’ of the plan, which opened on 21 February, closes at midnight on Wednesday 4 April. The council’s ‘publication draft’ is the result of extensive studies and consultation with residents, landowners, developers and statutory consultees like government agencies. Comments made during this consultation will go direct to the government, to be considered by a Planning Inspector at an Examination in Public. The council is stressing that this consultation is different because the Examination will only consider certain issues about the plan, and has produced guidance to help residents make comments which the Inspector can use. All responses must be made by midnight on Wednesday 4th April 2018 to ensure they can be considered by the Government.